It is hard for me to remember all the great recipes and cooking techniques I have learned over the years. Whenever I have the memory game problem I remember that I have to eat foods that help my brain. Just hitting my head against the wall works every once in a while but also gives me drain bramage. The first thing that comes to my mind in helping my cranium is making sure that I drink enough water and get enough sleep. Next I turn to the one thing I trust more than anything in this world, FOOD!! I like to start my Brainiac Attack by eating a good amount of salmon and cutting down on carbs and non-healthy fats. It amazes me how much diet can affect your mood, overall health and memory, and this is why I religiously follow Kathy’s blog Crab for the Cranium. January is the time of year where we all think it is time for a body reboot. This month I give you one of my favorite salad recipes that blends healthy fish with seasonal vegetables, the amazing Crab Salad with Citrus and Bitter Greens. The sweet Dungeness crab plays beautifully with the tart citrus and your palate is refreshed with every bite of the bitter greens. Enjoy this recipe and start doing those sit-ups!!! 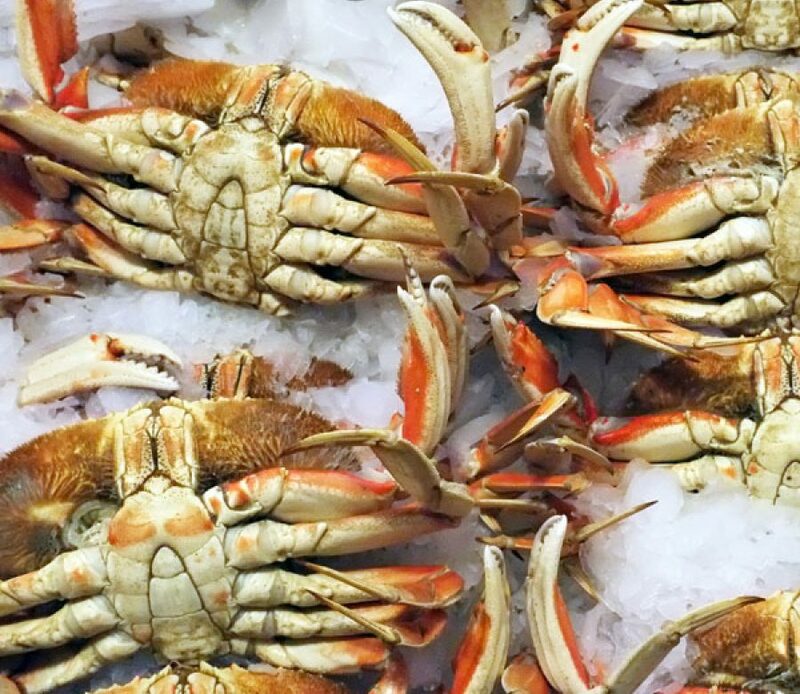 Check the Dungeness crab for shells and then set aside. Using a knife cut the rind off the citrus and then cut in between the pith or membrane of the citrus to get the perfect orange and lemon supreme-cut segments. Here is the link to my video showing you how to segment a blood orange with a supreme cut. Mix the segmented oranges and lemon with the teaspoon of olive oil. In a large bowl add the arugula, radicchio and frisee. Add the orange and lemon segment mixture and toss. Season the salad with salt. Place salad on a large serving tray and then top with the Dungeness Crab and walnuts. CHEF’S TIP: Add a little healthy fat with some avocado.